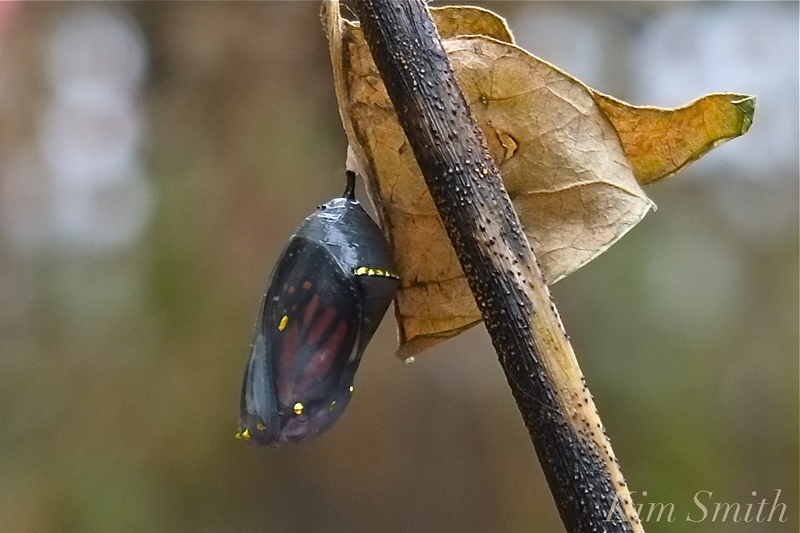 Today, November 13th, a Monarch will emerge from its chrysalis in a garden 2,800 miles north of its winter sanctuary. The thing is, Monarchs typically arrive in Mexico at harvest time and around Day of the Dead celebrations, or when Americans celebrate Halloween. In the language of the indigenous Purépecha peoples, the name for the Monarch is “Harvester” butterfly. Under the most ideal conditions, this Monarch won’t arrive until Christmastime. Along the northern leg of his journey, he will find little or no nectar plants as we have had several nights of freezing temperatures. All the wildflowers and garden plants have finished blooming for the season. With little fortification, is it possible for Monarchs to fly great distances? Biologists look for this type of climate change mismatch to track how global warming is affecting wildlife. Butterflies can survive rain. The water beads up and drips off its wings, but snow and below freezing temperatures are fatal to Monarchs. With a hope and a prayer, fair winds and good weather, perhaps our little intrepid Monarch will make it to sunny Mexico, or possibly, shorten his journey, and at least make Florida his home for the winter. Here’s hoping. WITH THE GREATEST APPRECIATION FOR OUR COMMUNITY OF FRIENDS AND SPONSORS, I AM OVERJOYED TO SHARE THAT TO DATE WE HAVE RAISED $23,960.00 FOR THE DOCUMENTARY FILM “BEAUTY ON THE WING” ONLINE FUNDRAISER! This entry was posted in Butterflies of Cape Ann, Butterflies of Massachusetts, Butterflies of New England, butterfly film, Cape Ann Wildlife, Gloucester, Lepidoptera ~ Butterflies, Skippers, and Moths, Monarch Butterfly (Danaus plexippus), Monarch Butterfly Migration, Monarchs in Mexico and tagged Beauty on the Wing ~ Life Story of the Monarch Butterfly, Cape Ann, Cape Ann film funding opportunities, film screening, fundraiser, Monarch butterfly, MONARCH BUTTERFLY FILM, Monarch butterfly migration on November 13, 2017 by Kim Smith.